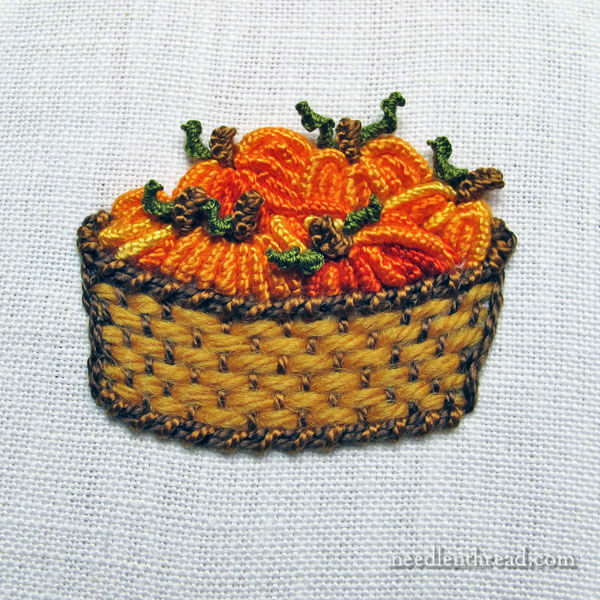 Last week, when I rounded up some autumn stitching ideas for you, I sneaked you a peek at a little embroidered basket of pumpkins. (Update, 2017) The wee pumpkin basket is a sample I stitched for DMC a while back, and it was on their website for a bit, but is no longer available there. I’ve since made the basket pattern and stitch guide available here on Needle ‘n Thread for free, if you’re looking for it! So if you’re looking for a little bit of autumn embroidery, you’ll find the pumpkin basket and stitch guide here. 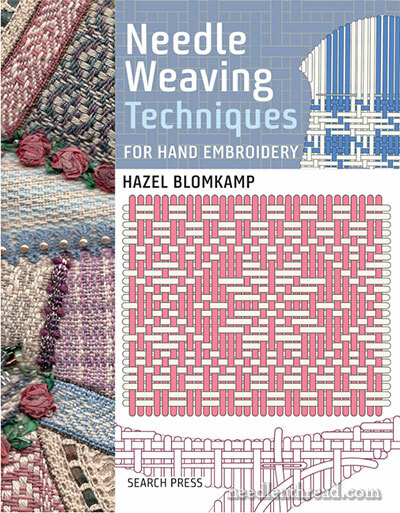 If you really want to get into needle weaving techniques, with all kinds of possibilities and patterns for woven fillings, you might enjoy Needle Weaving Techniques by Hazel Blomkamp. In the US, Needle Weaving Techniques is available through Amazon, here. Worldwide, with free shipping, you can find it available here through Book Depository. Mary, this is delightfully in my favourite orange. Mary, we are all around you. I wanted to send you a picture, but I seem unable to do it, so here’s my little poem with my very best wishes. we sniff this wind and the scent of rich grass. the pride of proper hunters. The bunnies run away and hide. Thanks, Mariolina! I love that – it makes a great visual image! Would the woven stitch work to make a specific plaid pattern? And this stitch has such a nice texture. The article on Commonthread was most helpful. Thank you again. Hi, Shelia – Yes, it would! You just need to “map out” the plaid design on a piece of a paper, to figure out the color placement. You won’t get a perfect plaid (which comes about not just because of the line directions, but also because of the blending of the colors at the intersections), but you’ll get a close match. The woven filling samplers article on Commonthread was great with all the variations on the woven filling and the different threads used a really useful article. I really like the pumpkin basket above the colours are lovely just right for the time of year and it looks relatively easy to follow, it would look lovely on a seasonal project. Thanks for sharing the article and the free pattern above for the woven basket with us. Mary, I enjoyed reading the article/tutorial and am looking forward to trying this method on my Peacock bed quilt top. I am hand embroidering the design and it has sat dormant for far to long. I brought it out the other day and am all excited about it once again. Thank you for sharing all of the information and tutorials that you do! I love your site. Have a wonderful creative day! Next Next post: Discover Floche! It’s Gorgeous – Try It!